Olivia, in Wellesley, looks joyful in her colorful, beautiful Floral Sheer Wool Embroidered Scarf! Granddaughter and grandmother sharing a precious moment at a family wedding in Oakland, CA. They look cozy in their Wild Roses scarves. Pam, Sukanya, Mikyala, and Tiffany in Elm Bank wearing Pam’s original design: Norwegian Roses four different ways! Dot wearing her Mint Thistle Merino Wool and Silk Scarf at the Newport Flower Show! Watch how the Hand Loomed 29 Colores Scarf is made!! 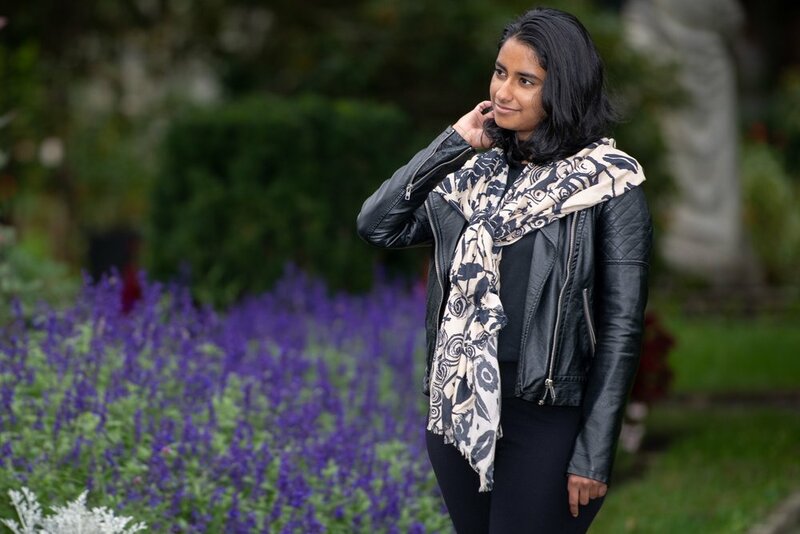 Sukanya wearing Black & Tan Female Flower Power Scarf at Elm Bank!